I just LOVE dry skin brushing! Although I am unsure if there are any scientific research done of dry skin brushing however if I did not feel the difference then I wouldn’t be doing this every time before showering! And if you haven’t tried this as yet – let me tell you that you are missing out on the pleasure most definitely! It is amazing. Why do dry skin brushing? The skin is our largest organ in the body that eliminates toxins as well. Supporting this elimination process by dry skin brushing would be optimal for health and well-being. Dry skin brushing is known to stimulate the lymphatic system of our body. The lymph vessels collect the waste materials from the skin. They are essentially little valves that are spread throughout the skin. When we dry brush our skin it helps move lymph fluid and allows it to eliminate toxins. Dry skin brushing also loosens the dead cells therefore it is amazing for cell renewal. Brushing will gently remove the dried, dead skin and other debris on the surface of the skin. On a regular basis our skin is able to eliminate more than one pound of waste. If the skin has closed pores it will be clogged with millions of dead cells and these toxins can cause various skin conditions. However skin brushing helps to reduce this build up by opening up the skin pores. It also improves circulation and blood flow in the body. Not only dry skin brushing has an effect on our circulatory system but it also rejuvenates our nervous system. According to Nadine Artemis (Living libation) oxygen ion levels are increased with air friction. This air friction is created during dry skin brushing. Skin brushing is also known to stimulate the acupressure point and massages the meridians. Dry skin brushing also makes the skin soft, tight, radiant and boosts elasticity. You will notice the new glow on your skin! Overtime it will help to reduce cellulite if you also take care of your diet and add omega 3. Dry skin brushing exfoliates the skin and strengthens the immune system. Which areas to focus on when brushing? Give extra attention to knees, elbows and ankles when you start brushing. Consider getting a brush for the face and neck area that will gently and effectively remove dead skin and invigorate the skin. Buy a brush that will also be gentle to use on your breast and areas near it. Of course you should be brushing the whole body. I love to brush in the morning before shower or bath. Ideally if you can do this every day you are literally supporting the body’s natural detoxification system. First thing make sure both your skin and the brush remains dry during this process. I simple apply the same method I use to Ayurvedic oil massage. Starting from the feet and working my way upwards. I do smaller and circular motion for ankles, knees, elbow and longer strokes on long bone areas such as arms and legs. When I am brushing my arms, I brush gently towards the chest and on the stomach area brush counter clockwise. Don’t brush too hard that it would irritate the skin. I also use essential oils to stimulate the lymph system. Have you ever tried dry skin brushing? If you have tell us what benefits you encountered? If not did this blog motivate you to do dry skin brushing? Leave a comment below! Where to buy the brush? I am providing two links to purchase the brush from either Amazon Canada or Amazon USA. The right brush is crucial for detoxing. The brush that I use and am recommending does not irritate the skin and leaves your skin soft. So try the brush below and leave a comment to let me know how it went for you! 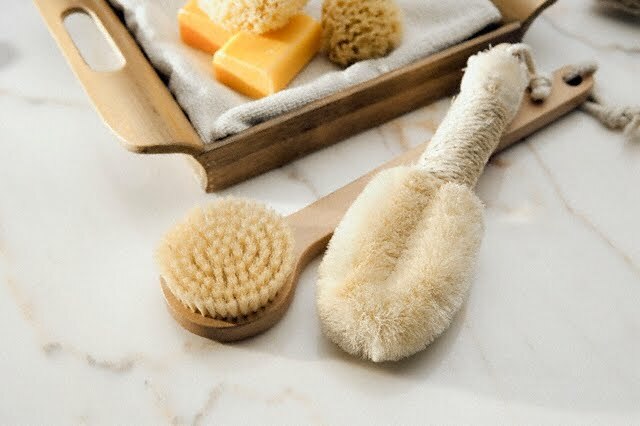 Wonderful post on dry skin brushing benefits! I do it every day and it really works great! What essential oils do you use for the lymph system? After breast cancer, I found U-Tube directions for breast massage to clear the breast lymph system. Wish I had known to do this from an early age. With your condition you must be careful and do a consult with Essential Oil expert. As some plants contain estrogen such as lavender. For general use aromatherapists recommend orange, grapefruit and helichrysum for lymph drainage. This is a great article. The only thing you should know is that when you are massaging your tummy, or anyone else’s, you ALWAYS go clockwise. That is the direction of peristalsis. Don’t send it backwards with counter clockwise massage. Thank you Aurora! Yes clockwise it is!